Utah Scientific solutions benefit a wide range of enterprise organizations that need to route video sources reliably. That’s basically anyone that works with video content in studios, auditoriums, classrooms, or conference rooms. . All of that content needs to find its way from cameras, computers, and other sources to displays, projections screens, monitors and more, and we can get those signals where they need to go. Cameras go obsolete, tape machines expire, and technology ages, but Utah Scientific products always stay on the edge of new technologies. That’s why we’re not afraid to back up our products with a free 10-year warranty and 24/7 service support. When SAS built a new Executive Briefing Center, its already extensive in-house media operation nearly doubled. 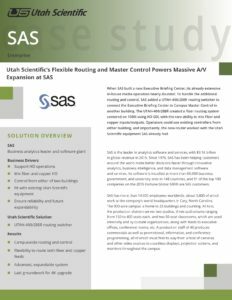 To handle the additional routing and control, SAS added a UTAH-400/288R routing switcher to connect the Executive Briefing Center to Campus Master Control in another building. The UTAH-400/288R created a fiber routing system centered on 1080i using HD-SDI, with the rare ability to mix fiber and copper inputs/outputs. Operators could use existing controllers from either building, and importantly, the new router worked with the Utah Scientific equipment SAS already had.